The Washington Craft Show invites you to meet and purchase beautiful work from some of the most exciting designers of fashion for your home or personal adornment. You'll find the latest works of art from some of the very best established and emerging artists in the country today! 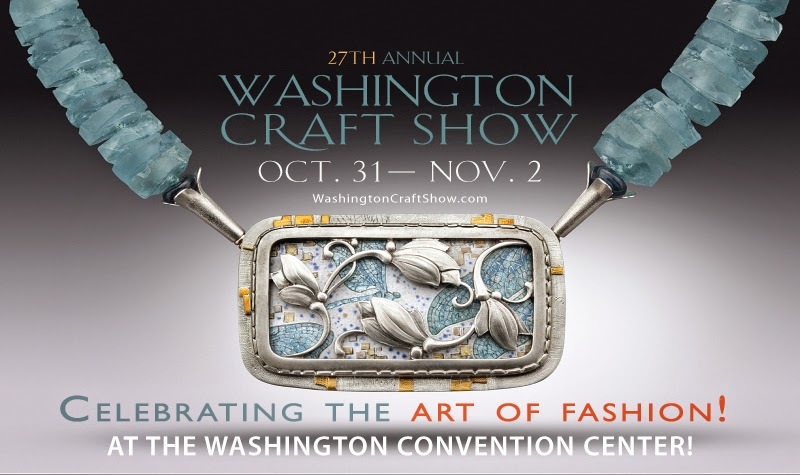 The 27th annual WASHINGTON CRAFT SHOW, October 31 thru November 2 at the Washington Convention Center. This year marks the event's 27th anniversary, and the show promises to deliver something for everyone. You'll find amazing works of art in basketry; ceramics; decorative and wearable textiles; furniture; glass; jewelry; leather; metal; mixed media; paper; and Wood. Some of the objects you will find at the show are functional, others purely decorative. Every item at the show will be either one-of-a-kind or limited edition. Daily screening:"CRAFT IN AMERICA: SERVICE"
Watch the latest installment in this Peabody Award-winning series exploring America's creative spirit through the language and traditions of the handmade before it debuts on PBS!. 1pm:"From the Ordinary, the Exceptional"
Lecture by jewelry artist Debra Adelson (Collingswood, NJ) who will share with our audience her method of turning an ordinary block of acrylic into amazing high-fashion jewelry. 1pm: Fashion Show featuring work by more than 3-dozen fashion artists whose work will be in the show. Following the fashion show, DC Fashion Expert Stephany Greene will sign copies of her new book,Stephany's Style Secrets; 7 Steps to Live and Dress Your Best. Lecture by jewelry artist Marianne Hunter (Ranchos Palos Verdes, CA), who will demonstrate ways in which she repurposes estate jewelry to give it new life and new purpose. Lecture by jewelry artist Lori Meg Gottlieb (Owings Mills, MD), who will discuss her transition from surgeon to jewelry artist, and how she turned a seemingly tragic event into a successful new career. Come walk the show with Gwynne Rukenbrod Smith, Executive Director of the Society of North American Goldsmiths. Gwynne will focus this tour on artists who use color in innovative and unique ways to bring depth and detail to their work. Hair and makeup for our fashion shows provided by Beauty Soirée.